Eat well. Stay healthy. That’s the message that a panel of experts from UC San Diego and elsewhere made clear in this fascinating discussion on the benefits of fresh, organic foods. Hear the case studies presented by people who have overcome serious illnesses by changing their diets. It’s true! Healthy food can be powerful medicine in treating diabetes, arthritis, Lyme disease, cirrhosis and high blood pressure, among other ailments. And the stories told here are compelling. Stepheni Norton recalls her own harrowing journey that led to the founding of Dickinson Farm and “farmacy.” Zen Honeycut, founder of Moms Across America, recounts how changing to a non-GMO, organic diet resolved the symptoms of allergies and autism in two of her sons. These kinds of outcomes didn’t surprise the MD’s on the panel — Gordon Saxe of UCSD’s Center for Integrative Nutrition and Sheila Patel of the Chopra Center for Wellbeing — as they confirmed their own experiences with patients using food as medicine. Thanks to Michelle Lerach and the Berry Good Food Foundation for convening this 7th edition of the Future Thought Leaders series exploring paths to a sustainable food supply. Now go eat some kale! 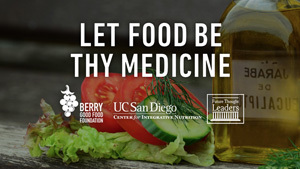 Watch Let Food Be Thy Medicine — Future Thought Leaders .